The story thus far: Dante, a poet and town prior in Florence, finds himself on a dark road of the soul. Before his spirit can fall to its ruin, he encounters Virgil, the greatest poet of classical Rome. Virgil, at the behest of Beatrice, a woman who was Dante's inspiration in life, offers Dante a journey through the realms of the afterworld, through which Dante may find his soul's salvation. He shall travel through Hell, Purgatory, and Heaven, with Virgil as his guide through the first two. Dante accepts Virgil's offer, and they embark. After passing through the gates of Hell, they encounter the souls of the cowards who took no stand in conflicts between good and evil, and then proceed to Limbo, the realm of the noble or innocent souls who were not baptized or otherwise not believers in the Christian faith. Dante and Virgil then travel through the first circles of damnation and the city of Dis, which punish those who embrace earthly appetites and goods at God's expense. Upon leaving the city, Virgil explains the plan of Hell to Dante. The circles that follow hold, in descending order of heinousness, those who commit violence, fraud, and betrayal. In the circle of the Violent, they travel along a river of boiling blood, in which the spirits of murderers and savage conquerors are imprisoned. They then enter the wood of the suicides, which also imprisons those who squandered or destroyed their belongings. From there, they walk alongside a desert where fire rains down. It is the prison for those who were violent against God and nature. The blasphemers are the first Dante takes note of, but they are only one of the many kinds of sinners who reside here, such as the sodomites. Among the latter is Brunetto Latini, who was Dante's mentor and role model while growing up, as well as Jacopo Rusticucci, Guido Guerra, and Tegghiaio Aldobrandi, three great Florentine leaders. 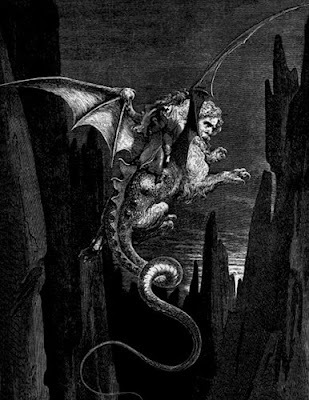 Dante and Virgil then come to a precipice, where Virgil summons a flying monster from the depths. That crosses mountains and breaks down walls and weapons! Near the end of the stony passage. But it did not bring its tail up to the cliff’s edge. And all the rest was a serpent’s trunk. It had two paws, hairy to the armpits. Were painted with knots and circlets. Nor was such cloth made by Arachne at her loom. On the edge where the stone bounds the sand. That, like a scorpion’s, armed the tip. In order to keep well away from the sand and flame. People sitting where it drops off. Go and see the state of them. Keep your talk there short. I went, where the sad people were sitting. Their sorrow exploded from their eyes. Sometimes from the flames, and sometimes from the burning ground. By fleas or flies or horseflies. And upon these they feasted their eyes. In which a lion had its face and manner. Showing a goose whiter than butter. Will sit here on my left side. I am a Paduan among these Florentines. His tongue, like an ox licking its nose. I turned away from the spent souls. Upon the back of that savage beast already. And he said to me, “Now be strong and brave. Now one descends by taking these stairs. Such I became at his words. Which makes a servant strong before a good master. He took me in his arms and supported me. Wide circles, and let your descent be gradual. Back and back, so then did Geryon move out. Gathering in the air with his paws. Sight of everything except the beast. Beyond the wind blowing in my face and from below. At which I stretched out my head and looked down. And I recoiled, trembling all over. That pressed on us from so many sides. From its master, disdainful and sullen. Nearby the foot of the jagged rock. It vanished like an arrow from the string.